This week, we continue our series on the Twins starting staff by taking a look at Kyle Gibson. For the series introduction and the first installment on Ervin Santana, look here. Gibson’s 2016 season was a bit of a step backward; from 2015 to 2016, his ERA jumped from 3.84 to 5.07, and his FIP increased from 3.96 to 4.70. Nevertheless, Gibson is a lock for the 2017 rotation, and will try to bounce back. Let’s take a look at the tools he’ll use to do it. Gibson throws five pitches: a four-seam fastball, a two-seam fastball, a slider, a changeup, and a curveball. He throws each fastball on just over 25% of his pitches. To right-handed hitters, he throws his slider just over 20% of the time, and his changeup and curveball each just over 10% of the time. For left-handed hitters, the slider and curveball percentages are swapped—22% changeups, 10% curveballs, and 10% sliders. 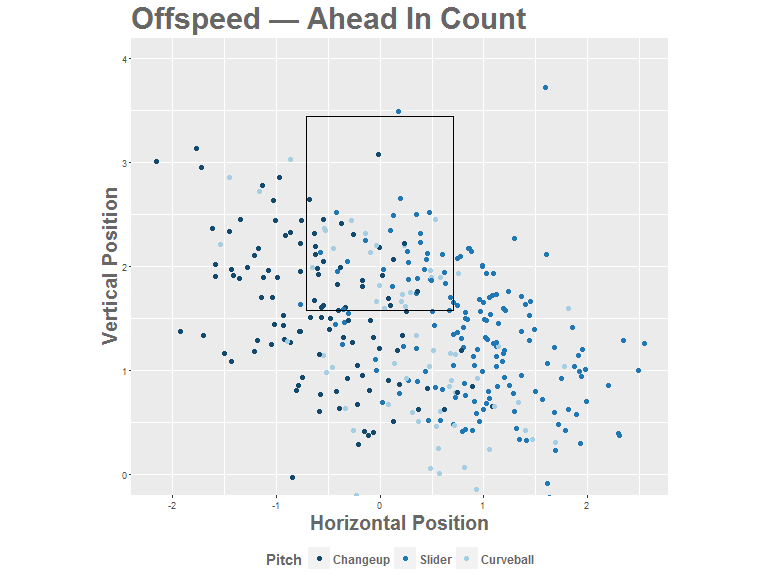 When Gibson is pitching, you can roughly break down counts into three categories: behind in the count (2-0, 3-0, 3-1), in which he threw offspeed pitches less than 25% of the time; ahead in the count (0-2, 1-2, maybe 2-2), in which he went offspeed over half the time; and middle counts (everything else), where his offspeed percentage hovered between 38% and 48%. Gibson’s higher PCPS makes him similar to Ervin Santana, who we profiled last week. But Santana only throws three pitches, so his PCPS and offspeed percentages by count do a pretty good job at capturing his mixing approach. Pitchers like Gibson, with multiple types of fastball and many offspeed pitches, can mix their pitches in ways these tools can’t capture. 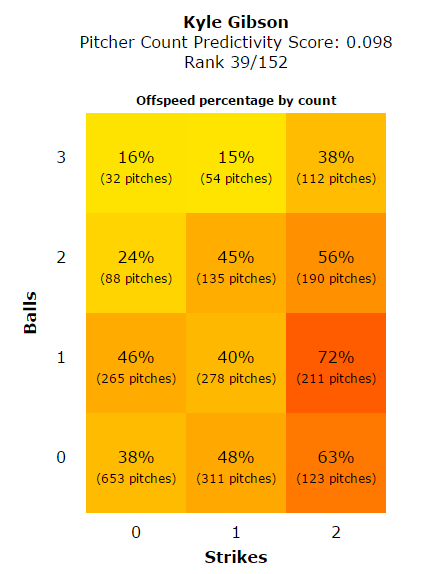 PCPS measures mixing between the two broad pitch categories: fastballs and offspeed pitches. But for many pitchers, including Gibson, a lot of important mixing happens within these categories as well. Finding these patterns means digging a little bit deeper into the numbers for fastballs and offspeed separately. 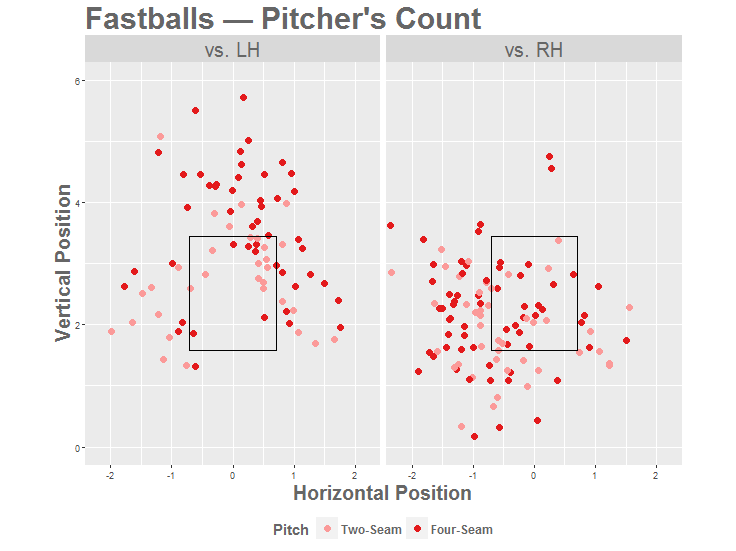 Gibson will throw either fastball in any count, but he favors his two-seam fastball when he’s behind in the count and his four-seam otherwise. When he’s behind1, Gibson throws two-seamers 39% of the time and four-seamers 23% of the time. In all other counts, he throws his two-seam fastball 23% of the time and his four-seamer 30% of the time. This pattern is especially prevalent when Gibson is up against left-handed hitters: his four-seam-two-seam split against them is 32% to 22% when he’s ahead in the count, and 17% to 44% when he’s behind. This tendency could indicate a different use for each pitch; his four-seam fastball is for working ahead in counts and striking batters out, while his two-seamer is for inducing weak contact (a function more important when a strikeout is less likely). 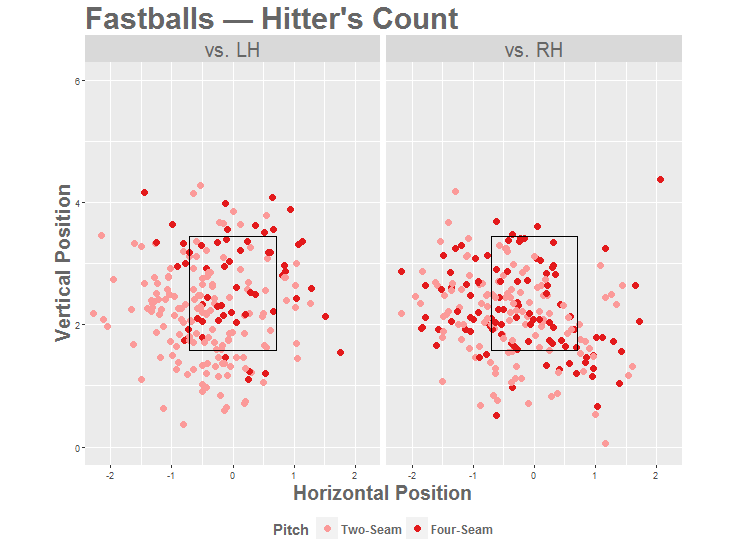 His fastball locations vary by count too. He mostly likes to work inside when he’s ahead, throwing fastballs up-and-in to lefties and down-and-in to right-handers. When he’s behind, throws more two-seamers to his arm side, especially when they tail low-and-away from lefties. As stated earlier, Gibson throws offspeed pitches especially frequently when he’s in three favorable counts: 0-2, 1-2, and 2-2. As it turns out, not only does he throw more offspeed in these counts, but he also uses his offspeed differently. When he’s not in any of those three counts, Gibson prefers to throw pitches that break away from hitters. He favors sliders to right-handed hitters and changeups to lefties, mixing in his curveball sparingly to each. To a lefty, Gibson throws 22% changeups, 11% curveballs, and 5% sliders. Right-handers see 21% sliders, 12% curveballs, and 8% changeups. Once he gets ahead, though, begins to favor the slider, regardless of handedness. His offspeed profile in these three counts is about 30% slider, 20% changeup, and 10% curveball. Why the disparity? Without reading Gibson’s mind, here’s a guess: in normal (non-two-strike counts), a pitcher’s focus is on throwing strikes to get ahead. The safe way to do that is to throw pitches that break away from a hitter, rather than ones that tail into their swing. Once the count reaches two strikes, though, it’s less important to throw strikes and more important to offer up your nastiest stuff to put hitters away. Gibson’s slider is fast and has a lot of break, and with no need to leave it in the zone, it’s a safer option to hitters of either handedness. A final note on Gibson’s offspeed: as a ground ball pitcher, he keeps it low in the zone. This is especially true with two strikes, where he uses low offspeed as a foil to fastballs up and out of the zone. As his high PCPS indicates, there are lots of patterns to be found in Kyle Gibson’s selection. In fact, there are more patterns in his pitching than his PCPS would indicate, given his wide arsenal of pitches. When you’re watching a Gibson start this year, keep an eye on how he mixes his three different offspeed pitches and whether his fastball movement is keeping hitters from barrelling his pitches up.